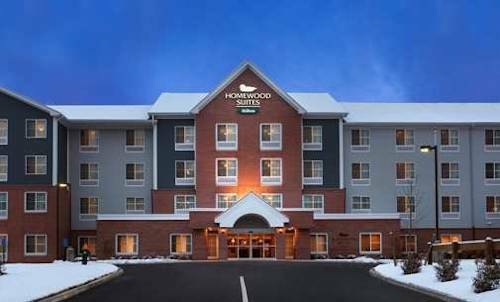 Enjoy warm hospitality and homelike surroundings in the Hartford/Central Connecticut area at our extended stay hotel Homewood Suites by Hilton Southington CT. Conveniently located just off I-84 this all-suite hotel in Southington is only 30 miles from Bradley International Airport and offers easy access to many businesses corporate headquarters and local attractions. Enjoy a fun day out at Lake Compounce Amusement Park or The New England Carousel Museum take to the slopes at the Mount Southington Ski Area or work on your handicap at Connecticut*s premier driving range - Golf Quest. Relax in a spacious studio one or two bedroom suite equipped with a range of amenities. Cook meals in the kitchen with a two-burner stove full-size refrigerator dishwasher microwave and utensils. Pick up essentials at the 24-hour Suite Shop or make use of our complimentary grocery shopping service. Wake up to a complimentary hot full breakfast buffet and Monday through Thursday relax over complimentary dinner and drinks* at our evening reception. Host an event with our flexible meeting space print documents and surf the web with the 24-hour business center and work while you travel in the Executive Center. Enjoy important leisure time and swim in the indoor pool or workout in the fitness center. Our tranquil outdoor patio area is the perfect place to socialize or unwind with a good book. *State and Local laws apply. Must be of legal drinking age. All reservations must be cancelled by 11:59 PM the night before arrival host time unless deposit is required. If this reservation has been made electronically please cancel it electronically to avoid confusion and a no show bill. Policy is subject to change.